Tenniel’s image of the duplicitous oyster and bread eating duo. Throughout my childhood I enjoyed Alice in Wonderland and Through the Looking Glass, particularly many of the rhymes such as The Walrus and the Carpenter. Now, still in the thrall of sandwiches, I appreciate it even more. I love the sandwich lurk performed by the wily Walrus and Carpenter on the gullible oysters: a beguiling ‘come for a walk’ ruse on the sand coupled with misplaced oyster trust. However, it is the bread in which the unfortunate oysters are swaddled, that now captivates me. What makes up bread? It’s not just barley, wheat or rye! 4 phonemes as seen when it is transcribed in I.P.A. : /brɛd/. There is one medial vowel digraph <ea> representing the shortened vowel phone /ɛ/. Along with dead, and lead (n.1), the vowel shortened in Middle English the period between 1150-1500 (Online Etymology Dictionary). So why not just *<bred>? For a start it would clash with the past tense of <breed>. The <ea> digraph in <bread> signals a different meaning from <bred> and connects the word with its Old English etymon bréad. I am fascinated by the <ea> digraph; it’s been something of an obsession as I mull over questions and continue to gather evidence with my students. However, rather than the vastness of the <ea> digraph quest, it’s a narrower focus on <bread> in this post. To understand the frequently misunderstood terms letters, grapheme, phoneme watch: Real Spelling’s Orthographic Phonology. Bread attested in 950, is of Old English origins, bréad, plural bréadru. The denotation then was “bit, crumb, morsel; bread”. Bread originally denoted a piece of food. As bread is the most common and available of food staples, its senses gradually changed from ‘piece of bread’ to ‘broken bread’ to ‘bread’.The Old English bréad is derived from Germanic *brautham with cognates in German brot and Swedish brod. The initial denotation of bread as ‘ piece, bit, fragment, was similar to Latin frustum’ (OED). However, beyond the hypothesized Germanic root, the story is unclear. Some etymologists favour tracing bread to a P.I.E. root *bhreu with the claim of a link between <bread> and< brew>. However, the O.E.D. states emphatically that there is no evidence for this. In Old English the word bréad is rare. So what was the usual word in Old English that referred to bread? None other than <loaf> – the close relationship indicated by the phrase a ‘loaf of bread’. A medieval baker with his apprentice. The Bodleian Library, Oxford. OE hláf:loaf was the more common term for <bread> – and like bread, attested from the 9th century. Some etymologists suggest a connection with Old English hlífian ‘to rise high, tower’, in reference to the ‘rising’ of leavened bread. The OE etymon can be traced to Proto-Germanic *khlaibuz , although beyond this the story is cloudy. However, before 1200 <bread> displaced <hláf> as the name of the substance, leaving <loaf> the sense of the whole unsliced bread. ‘To loaf around‘ is not idling while snacking on bread. The homophone <loaf>, a verb and the antonym of work, is formed from the back formation of loafer as in ‘idler’ . Loafer has also denoted a type of shoe since 1937, presumably for idle pursuits. This loaf, of uncertain etymology, is of a different root to the bready loaf and is attested from 1837. The connection of nobility with bread is surprising.The Old English word for <lord> was hláford. This is from an earlier compound hláfweard where the second element is OE weard: guard which becomes unstressed and reduced to hlaford. No doubt dear reader, you have spotted in both Old English etymons, the element hlaf which gave ‘rise’ to <loaf>. The word <lord> denotes the head of a household in his relation to the servants and dependents who ‘eat his bread’ ,a sense comparable with OE hláf-ǽta : ‘bread-eater’, a servant (OED). Today, lord and lady cannot be analysed morphologically. They are are simple words, free base elements, but lurking beneath the denotations of lord and lady is the suggestion of power and control; those who dispense bread, the staff of life, have indeed power over the lives of others. Dough is a free base element, a noun, but later is used verbally. Its orthographic structure signals that it is neither the animal <doe> nor the musical note <doh> and as English orthography always does, the meaning is signalled in its orthographic structure. The word is simple- no affixes, not so the story! Dough is a free base element composed of five letters, and two phonemes, with the letter string <ugh>. The <ugh> is not there to confuse. It is not an example of irregularity, nor a tricky word, nor an oddball! These are merely the labels we attach when we struggle to understand or become obsessed with categorizing into small boxes only to find orthographic entities cannot be so easily confined. Rather <ugh> in the final position of the base element <dough> is an etymological marker, often a clue as to Old English roots. Yes <ugh> can be a trigraph and in a final position it often signals /f/, but not always. Sometimes as in <dough>, <though> and <plough> its role is etymological, a connection to a time and place in the past. It’s important to remember pronunciation shifts over time and accents vary. In the north of England <dough> was pronounced: /dʌf/. Duff, 1840, the variant form of <dough>, now denotes a dough or paste, or ‘a flour pudding boiled in a bag; a dumpling’ such as a ‘plum duff’. Ayto describes the ‘plum duff’ as a ‘fortifying pudding’ essentially the same as in its beginnings before going upmarket as the Christmas pudding. The plum, which little Jack Horner pulled out from a pie, is not a ‘plum’ but a raisin. Read sociologist Henry Mahew’s 1861 description of the plum duff sellers on London streets here. Too much plum duff or the rich Christmas pud can cause the unwary lurid nightmares. Dough, like bread is attested from the 9th century and can be traced to PIE root *dheigh- denoting mould, form, knead. The Old English element *dig- , as noted earlier, formed the second element in lady . The proto Germanic *daigaz denoting ‘something kneaded’ led eventually to <dough>. Dough carries connotations of working by hand, of kneading, shaping and moulding into loaves. It was not only in Old English and the Germanic languages that this PIE root with its kneading and shaping connotations spread its tendrils. Latin fingere ~ fictum, the second and fourth principal parts of the Latin verb that are relevant to English orthography, denoted ‘shape, form, devise, feign,mould’. Once the suffixes are removed from the Latin stems, the twin base elements emerge: <fing> and <fict>. The Online Etymology dictionary observes that ‘the related Latin words included the literal notion “worked by hand,” as well as the figurative senses of “invented in the mind; artificial, not natural”. The derivatives in current English: feign, effigy, fiction, indicate the English bases of <fige> ,<fict>, and <feign> echoing faintly of things shaped. From the past participle fictus is ficture, a noun denoting feigning, obsolete, but the need for this may re-emerge. While <fing> does not appear to be as productive as its twin base element <fict> there is the wonderful adjective fingent denoting ‘given to fashion or moulding’, formed on the present participle of Latin fingere. I rummaged further in the OED to unearth fict , in 1609 a free base element, used nominally, adjectivally and verbally denoting a musical term in which ‘the accidentals were supplied, instead of being left to the singer’s discretion’. Crust: Upper crusty or upper crust in reference to social superiority was expressed from 1836 onwards. Crust is of Latin origin, crusta, attested in English since 1330 and denoted: ‘the outer part of bread rendered hard and dry in baking’. The Latin root shifted to crouste in Old French which formed the basis of modern French croûte and croûton, the latter of which migrated into English the early 19th century (1806). Latin crusta also led to words such as crustacean as well as crystal and custard – originally a pie enclosed in a crust (Ayto). Add the <y> suffix to the free base element <crust> and you have the adjective crusty which can denote people who are : ‘Short of temper; harshly curt in manner or speech: the opposite of suave or affable‘ (OED). This figurative use is attested since 1570 joining a long list of synonyms for the irritable. Knead a free base element, denotes: ‘to mix and work up into a homogeneous plastic mass, by successively drawing out, folding over, and pressing or squeezing together; to work up (moistened flour or clay) into dough or a paste; to make (bread, pottery) by this process’ (OED). Today it is pronounced /niːd/. The graphemes signal the difference of meaning from its homophone <need>. Knead is made up of the consonant digraph <kn> and the vowel digraph <ea> this time representing the phoneme /i:/. Old English cnedan is “to knead,” from Proto-Germanic *knedan. Originally it was a strong verb – past tense cnæd, past participle cneden. It’s not just the word itself that has a history, so too the graphemes. In this case <kn> once <cn> was fully voiced. Old English <cn> was frequent – at least 82 entries- but by Middle English the <cn> was ‘lost or turned to <kn>’ (Online Etymology Dictionary). By 1750 the pronunciation was reduced to the /n/. The orthography of <knead> with its <kn> digraph indicates that the function of a grapheme signals more than mere pronunciation. 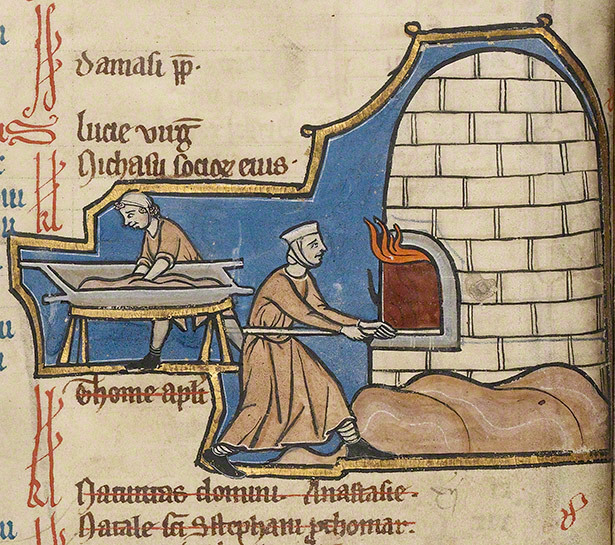 Baker kneading and baxter baking bread (detail)from psalter by an unknown illuminator, Belgium, mid-1200s. Bake is Old English origin, the verb bacan derived from proto Germanic *bac which can be traced back to PIE *bhog- from *bhe- to warm.This emerged in Greek as ϕώγειν:phogein to roast, parch, toast. Bath too may have derived from this PIE root, originally suggesting heating rather than immersing in water, likewise the word bask. Baxter from Old English bæcestre, was the feminine form of bæcere, from bacan to bake. Although used of women as late as 16th century in Old English, it too could refer to men and in Middle English referred to both sexes. Today it survives as a surname smelling faintly of freshly baked bread. 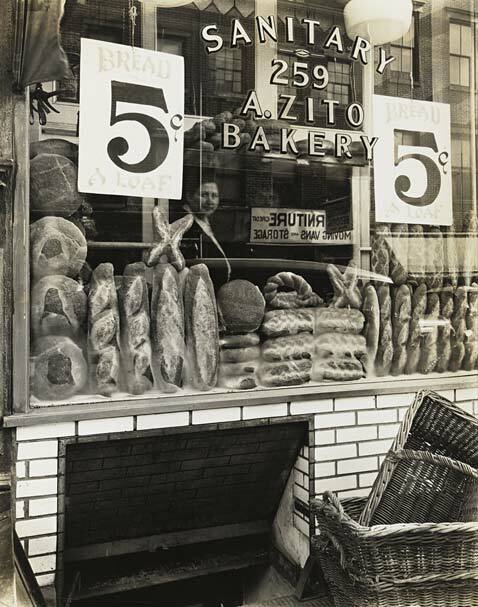 As I peer in through Zito’s window, I wonder about the etymological origins of ciabatta, focaccia, brioche, and baguette. Say them aloud and they become a small poem. 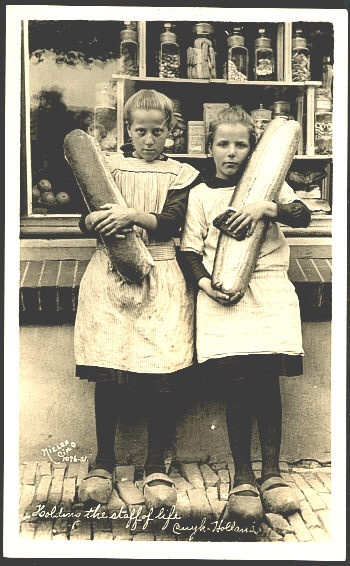 Although baguette is attested from 1727, it wasn’t until 1958 that it denoted:”a long, thin loaf of French bread”. It entered the English lexicon from French, via Italian and the root Latin baculum a stick. English borrowed the diminuitive bacillus in 1877. Consider carpet slippers, worn down-at-heel and you have the inspiration behind ciabatta from an Italian word meaning old slippers, attested in English from 1997. The Norman etymon broyer to knead is at the heart of a delicious brioche. Broyer became French brier and in the 15th century led to brioche. It migrated into English, around 1824. While its pronunciation suggests French, the Norman etymon broyer: to grind, pound derives from West Germanic *brekan to break and reminds us that the Normans were men of the north- Norse men. The hearth is the focal point of focaccia. Attested since 1881, it’s been “borrowed” from the Italian etymon focaccia of the late 14th century.This was from post-classical Latin focacia feminine form of focacius ‘bread baked in the hearth’, from classical Latin focus: hearth. (OED). Yeast is a vital ingredient of leavened bread and a free base element made up of four phonemes, four graphemes with the <ea> digraph in the medial position representing /i:/. Yeast of Old English origins gist, derived ultimately from a PIE root *yes- “to boil, foam, froth”. The ancient PIE root produced Welsh ias: boiling and Greek: ζεῖν zein to boil, ferment. This Greek root has led to a word far away from the bakery and the kitchen – eczema. Attested since 1753, from the Greek etymon ἔκζεμα: ekzema, the itchy, inflamed skin condition still carries connotations of boiling. This wordy ramble, ‘a pleasant walk, a pleasant talk’ of bread, bakers and baking returns to The Walrus and the Carpenter, companions on their oyster eating binge. Etymologically, a companion, 1325, denotes a friendship formed around bread. A companion denoted one’s ‘messmate with whom one habitually eats meals’: <com +pane+ion>. The bound base element <pane> has derived from Latin panis bread and the word itself via Old French. This Latin root leads to pannier– initially a bread basket but extended to any large basket for provisions, and also pantry originally ‘a room or set of rooms in a large household in which bread and other provisions are kept’ (OED). The panter or its variant form pantler was the officer in a household who supplied the bread and had charge of the pantry, the bread-bearer, even bread-controller regulated the distribution of bread in the royal household and had supreme authority over all the bakers of the kingdom; bread-choppers (1600) and bread-chippers (1616) pared the crusts – occupations long since faded.